Snow Day may be officially over, but it’s still treacherous to walk outside, due to the unsalted ice and piles of shoveled snow. Thank God for Falchi’s! The chicken noodle soup at Don Tapas was nothing special: pretty boilerplate mix: chicken broth, fat noodles, onions, carrots and celery, parsley. It was nicely warm. Then again, I should had picked up their tuna and avocado sandwich. Then again, it was a good thing that I didn’t get the tuna, because I saved some money (paying cash) on the $2.50 beef empanada from Karu Cafe: their beef is shredded, not ground, and it’s stuffed in a golden pouch with ground-up hard boiled egg. Simply delicious! 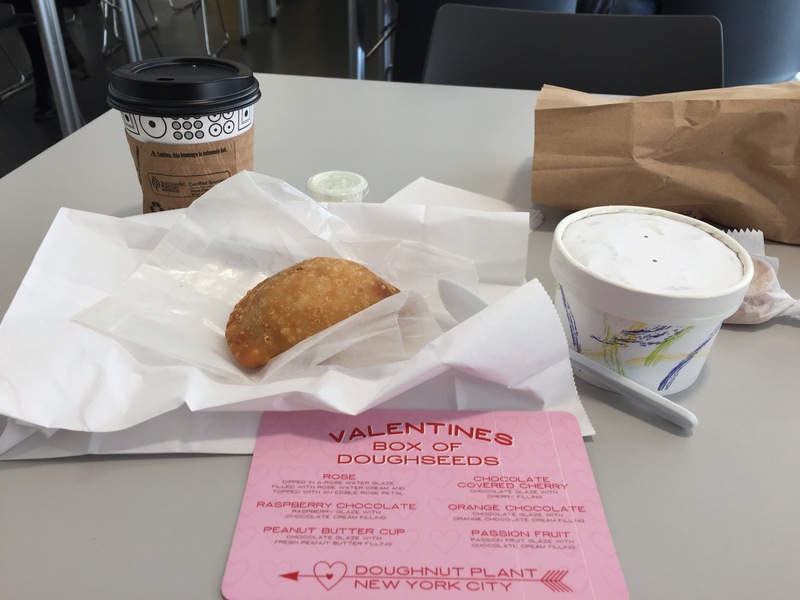 While I was at the Doughnut Plant ordering my Spearimint tea (and beignet, I still need to pick that up), I noticed one of their offerings for February is their “Valentines Box of Doughseeds”: Rose, Raspberry Chocolate, Peanut Butter Cup, Chocolare Covered Cherry (I almost ordered that one), Orange Chocolate and Passion Fruit. Dear friends, if you need something special to give to your sweetheart or to yourself, and regular chocolates are becoming “meh”, try these doughseeds! Ah, the pecan praline beignet doughseed, so delightful and delicious! The praline glaze was the best: sweet, almost tastes like maple cream with chunks of pecans dotted on the dough. Yum! It was definitely worth it, walking back in the snow…I’m sharing the love :).